Last night is why we watch playoff hockey. Just when every Kings fan in the Twitterverse was about to throw in the towel, the tides turned. Los Angeles played without Jarret Stoll, whose condition is day-to-day after suffering a head injury when Sharks’ Raffi Torres made what was deemed an illegal hit in the first game of the series. Torres has been suspended for the remainder of the Semifinals. Early into the first period, Kings’ forward Jeff Carter shed first blood with a furious snipe that San Jose’s goaltender Antti Niemi was unable to stop. Before the first intermission, Drew Doughty put the Kings ahead 2-0. But a two-goal lead is never a safe place, as anyone who saw the Bruins vs. Maples Leafs Round Seven game earlier this week can testify. The Sharks’ Patrick Marleau and Scott Gomez both scored second-period goals to tie things up and ensure that Jonathan Quick didn’t get himself two shutouts in a row. 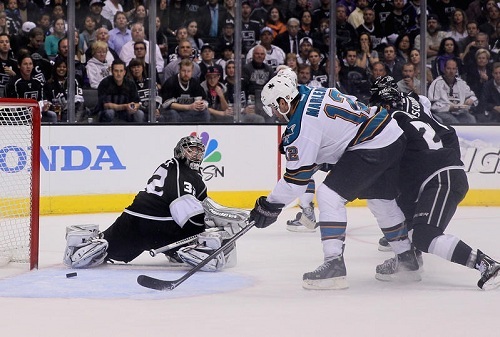 San Jose Sharks’ Patrick Marleau gets past Los Angeles Kings’ Jedi ninja Jonathan Quick. The third period is when things got exciting. A shot by Kings captain Dustin Brown hit his own teammate, Anze Kopitar, in the face. Kopitar went down, and it took what seemed like an eternity for him to get on his feet. He left a puddle of blood as he skated off. In his absence, San Jose’s Marc-Edouard Vlasic’s wrist shot put his team up by one point, though it would be his delay-of-game penalty that would give the Kings a 5-on-3 advantage in the final minutes of the game. After missing much of the third period, Kopitar returned for another shift, to the Rocky theme song. Though it boosted the energy at the Staples Center, it didn’t seem like it would be enough for Los Angeles to tie things up and force an overtime shift. With just under three minutes left on the clock, Sharks’ Brad Stuart was sent to the box for a tripping call against Tyler Toffoli. Within seconds, Vlasic received his penalty. Brown tied the game, and moments later Toffoli hit a shot that rebounded off of Niemi’s pads. Trevor Lewis drove it home to win the game. 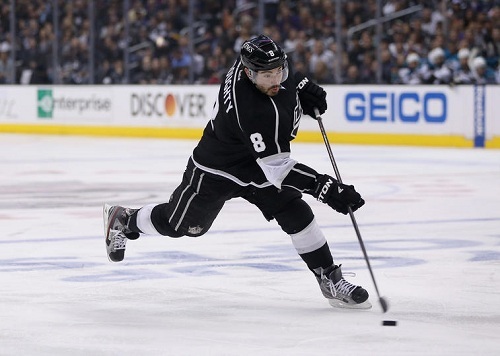 Los Angeles Kings’ Drew Doughty, scoring goals like a boss. Coach Darryl Sutter celebrated in his post-game comments by talking about how one can get three pairs of glasses at Costco for about $20.00. Oh, Sutter. We know that when you go home at night, you smile and sleep like a baby. The Kings know that they can’t rest easy. In the playoffs, being up two games doesn’t offer much in the way of security, considering they were down by a couple of games in the last round. It seems, though, that their lucky number last night was the number two. They were up 2 goals early in the game. This was Game 2 of Round 2, and they scored 2 goals in the last 22 seconds of regulation, earning their 2nd win of the series, thanks to 2 Sharks penalties that occurred in the last 2 minutes of the game and gave the Kings a 2-man advantage. Quick also became the 2nd goalie in franchise history to win 26 playoff games. The first was the other #32, Kelly Hrudey. If you need another number with a two in it, the win was the Kings’ 12th straight home win (and sixth consecutive playoff win).